March rocked! We passed our $710K and $720K net worth goals this month! 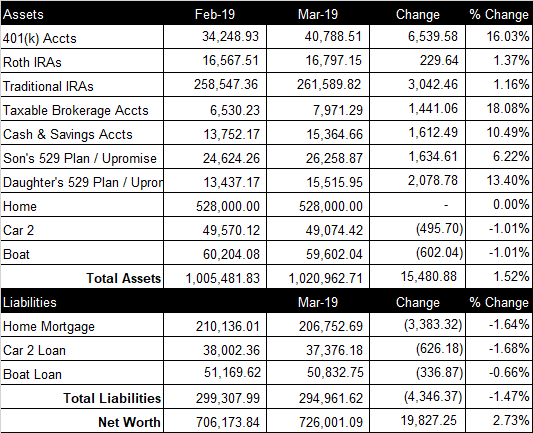 Our net worth increased $19,827.25 from last month to a total of $726,011 (spreadsheet screenshot). Our retirement accounts are comprised of our 401(k)s, our Roth IRAs and our Traditional IRAs. We contribute 7% to my wife’s 401(k). My wife’s company matches up to 5% of her 401(K) contribution (100% vested when deposited) and chips in an additional 5% on top of the match in March (vests over 3 years). My wife’s company just deposited the $10.692.55 401(k) match into her account😊 This month, we contributed $1,819.41 to her 401(k). We contribute 10% to my 401(k) and my company matches up to 4% and deposits the match in March (100% vested when deposited). My company just deposited the $3,174.34 401(k) match into my account😊This month, we contributed $501.93 to my 401(k). The total balance of our retirement accounts increased $9,811.68 from last month to a total of $319,175.48. Currently, our brokerage account consists of a handful of stocks and some cryptocurrency (I prefer to track crypto in the “Brokerage Accounts” field rather than “Cash & Savings Accounts”). The total current value is $7,971.29, up $1,441.06 from last month primarily because we invested a little more money. Cash and savings accounts consists of a small sum of cash at home and our online savings accounts balance. It does not include our checking account balance that we use to pay our bills each month. Our cash and savings accounts increased $1,612.49 this month, bringing the total to $15,364.66. Our kids have 529 Plans through Vanguard. This month, we contributed $1,200 to our son’s 529 Plan and it increased $1,634.61 from last month to a total balance of $26,258.87. We contributed $1,800 to our daughter’s 529 Plan and it increased $2,078.78 from last month to a total balance of $15,515.95. We use the $528K purchase price that we paid in July 2016 for our home value. Current comps in the area are ~$530K. The current balance of our 15-year, 2.85% mortgage loan is $206,752.69. We paid $2,100 extra towards our home mortgage principal this month. I have a company car and gas card. My wife has a 2017 SUV with 50,000 miles. Her company gives her $300/month auto allowance and $0.53/mile reimbursement. The loan balance on my wife’s car is $37,376.18 at 2.79%. We also have a ski boat with a loan balance of $50,845.292 at 5.24%. We paid $100 extra towards our boat loan principal this month.